Welcome To Your Brain: "...[a] short, snappy tour of the nervous system"
"...[a] short, snappy tour of the nervous system"
Another review! This one from Mary Ann Hughes for Library Journal in the upcoming February 1 issue. 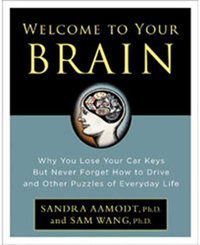 She writes that we "have written a highly engaging little introduction to the latest in brain science, designed to entice the casual reader who knows little about the subject....recommended for all public and school libraries." Hughes also liked the cute cartoons. We agree that these are excellent. We were lucky to work with a terrific illustrator, Lisa Haney, whose work can be seen here. We'll soon post a few of her images in rotation in the sidebar. (Update: done.) Thank you, Lisa! Another note: the LJ reviewer expressed a desire for a bibliography. We are working on a way to present references to scientific literature on this website. This has the advantage that we can provide the latest information that we find on a topic. Your book is a very interesting one, demistifying many false and dangerous myths. I appreciated it very much and I thank you for you effort. Nevertheless I'd really would like a bibliography too; so, please post it as soon as possible on this blog. There are many important issues, like those about Amblyopia (my eight year old son suffers from it and at the moment he's being 'treated' with occlusive patches) that claim for references in order to correctly help orientating the readers.